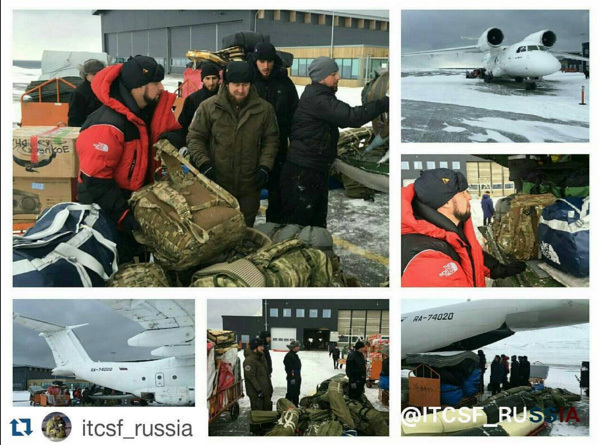 Chechen strongman Ramzan Kadyrov’s «Flying Squad» has arrived to Murmansk, ready for joint exercises with other services in the Arctic. Moored at Atomflot service base just north of Murmansk, the nuclear-powered icebreaker «Sovetsky Soyuz» will stage a drill involving terrorists taking the ship hostage, state TV channel Grozny reports. The anti-terror operation includes many unexpected situations to be solved by Flying Squad and Terek, another Special Rapid Response team also part of the Chechen Republic’s Rosgvardia, the National Guard of Russia. In April 2016, the same paramilitary group trained at the North Pole, then parachuting to the ice from an aircraft taking off from Murmansk. Cargo and other personnel were brought in to the ice via Norway’s Longyearbyen airport on Svalbard, the Barents Observer reported at the time. Ramzan Kadyrov’s own aide on law enforcement, Daniil Martynov, headed the group loading equipment into the Russian An-74 aircraft at Longyearbyen airport. Exercising anti-terror operation on board a nuclear powered icebreaker is only one of several tasks to be practiced in the Arctic over a period of several weeks. The Chechen TV report says nothing about where in the Arctic other parts of the exercises will take place. The first part of Rosgvardia’s exercise started in late March when several helicopters were observed in the skies above Murmansk, Severpost reports. Photo from Kadyrov_95 on Instagram from the 2016 operations at Longyearbyen airport. Exercising at the North Pole from the Russian ice-base Barneo in 2016, the Chechen special forces said they identified «employees of foreign special services who came under cover as journalists», Severpost reported. The newspaper quotes Kadyrov’s instagram profile where the Chechen leader said the persons came from one of the «northern countries», without naming the country. «The Arctic is of great importance for Russia. Therefore, the expedition acted in the interests of our Motherland, our Fatherland!,» Ramzan Kadyrov wrote. Barneo 2018 is currently under making in the high Arctic. On Saturday, head of the ice base, Irina Orlova, wrote on her Facebook profile that helicopters are currently flying around from 89 degrees north in search for suitable ice on where to establish the runway for aircrafts to bring in more equipment currently waiting for take off from the airport in Murmansk.